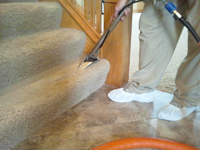 November Carpet Care Tip from PRO: What Does No Residue Carpet Cleaning Really Mean? This month we're going to cover another topic we've been hearing a lot of questions about: What is No Residue Carpet Cleaning? Thankfully, we have the PROs at Professional Carpet & Upholstery Cleaners, Inc. to help make sense of this popular 'No Residue' phrase that seems to be on everyone's lips. After reading, you'll be knowledgeable about the facts of 'no residue' carpet cleaning, and you'll be making carpet cleaning decisions like a PRO! What is No Residue Carpet Cleaning? 1) Vacuuming, 2) Application of pre-conditioner/emulsifier (soap), 3) Agitation and 4) Hot-water extraction rinsing. Professional carpet cleaning pre-conditioner/emulsifier (soap) can have varying ingredients: There are a wide range of pre-conditioners available from which professional carpet cleaners may choose. These include environmentally friendly and low-impact formulas (which we at PRO select for our general use). Professional carpet cleaners can also choose how much (or how little) product to use in a single application - we choose to use the smallest amounts possible to get the job done right. This ensures less long-term impact on your home environment, and the environment at large. When it comes to residue, very simply, if you use less product to begin with, there is less to remove during extraction. Soft water - just part of the answer. Our vans are stocked daily with fresh, softened water. This is important because softened water actually aides in the cleaning process, allowing all pre-conditioner to be removed easily, leaving no residue. Another key point we'd like to mention is a strong focus on IICRC certification: A technician's knowledge regarding all aspects of carpet cleaning ensures the best carpet cleaning experience for you. Your technician, if well-trained, knows precisely how to ensure that your carpets are thoroughly rinsed clean. What you've been hearing is true. It's important to note that leaving residue from the pre-conditioning process can eventually lead to faster dirt buildup in carpets and fibers; so a solution to leftover residue very beneficial. So what is the solution to carpet cleaning residue? Simple: a combination of the right product (amount and type), hot water extraction with softened water, and a knowledgable technician who will carefully clean your carpets using the best processes available, such as those recommended by the IICRC. Finally, there are options - and we offer them. The standard pre-conditioner (step #2 above) may be exchanged to fit client-specific requests. In place of our typical environmentally-friendly and low-impact emulsifier formula, we are happy to substitute a pure-water-only, or vinegar and water only, carpet cleaning process at your request. We are familiar with, and confident in, these alternative carpet cleaning choices; and we're happy to adapt our cleaning service to fit your individual wishes.